During a recent trip to Chicago with my kids, we visited the Museum of Science and Industry — where millions of people learn how tornadoes work and how chemicals combine, explore facts about our bodies and genes, and explore what our future might look like with gadgets and systems envisioned by today’s innovators. Good, solid science and industry. We visited the Field Museum of preserved artifacts (like Sue, the dinosaur with 90 percent of her bones recovered). There we were interested in the current biomechanics exhibit, which explains the amazing ways that certain animals hear, move, fly, eat, survive. Nothing much is known yet about how we think. At the Adler Planetarium, we watched films about the evolution of planets and galaxies well beyond our own solar system — places we didn’t even know existed until recently, when new technologies enabled us to see them with our eyes. We learned about some of NASA’s astronauts. The sixth man who walked on the moon is not a household name for most. 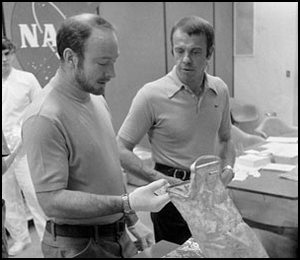 In 1971, Edgar Mitchell, along with the more commonly known Alan Shepard, spent 33 hours on the lunar surface doing scientific experiments (and throwing a javelin). I did wonder why Mitchell, founder of the Institute of Noetic Sciences, was not featured in any of the museums as an innovator trying to understand if the universe is one living, evolving, conscious being. A few days prior to our Chicago visit, more than a dozen people sat in my living room who know Mitchell’s Institute as the place where people raise questions designed to bridge the gap between science and spirit in our understanding of human consciousness. Despite science’s wonderful technological achievements, Mitchell realized that we had barely begun to probe the deepest mystery of the universe. He was convinced that the uncharted territory of the human mind was the next frontier to explore. Within two years, he had founded the Institute of Noetic Sciences. The sense of “knowing” is something those of us in my living room shared at our second group meeting when we revealed stories that we don’t tend to talk about. It is easy to talk about consciousness and an interconnected universe. Those are warm and fuzzy concepts that are akin, in these modernized days, to saying we use yoga and meditation to de-stress and that we care about global warming. It is comfortable to talk about the mystery of entanglement in quantum physics – something we cannot yet explain — even Einstein considered it “spooky” — but it has the stamp of approval as a serious quest by scientists. It is reassuring to know that Edgar Mitchell was trained as a Life Scout in Boy Scouts, served as a U.S. Navy captain, and earned his doctorate of science at MIT prior to his career with NASA. It might even feel safe to know that he encourages fellow scientists to probe for the “structure of the zero point field that fills all space and supports all matter” to understand “non local resonance” to permit remote matter to share information. But when you hear that Mitchell conducted ESP experiments while in space… that he believes a kidney issue was successfully treated long-distance by Adam Dreamhealer… and that he believes there are extra-terrestial forces that have visited us, as he talked about on a Dateline TV show in 1996… well, that’s when most people automatically smirk and tune out. It’s understandable. Which is why many of the people in my living room for our June 18 meeting felt an almost audible sigh of relief that we could talk freely about the personal stories we don’t tend to share. Others in the room talked of precognition dreams, near-death experiences, transformational moments — and of learning not to talk about it. It is hard to be analytical and skeptical in the face of pivotal moments that stamp you – as if you’ve been gently jolted awake to a sensation that doesn’t make sense in our “normal” ways of seeing and hearing and touching the world. A moment that is unmistakably important, unlike all the other moments in our days. It leaves you profoundly sure that there is something we haven’t figured out yet about consciousness in the universe. And it is not, for us, explained by a singular voice in the heavens. As generally analytical creatures, we do want to try to understand what, exactly, it is. And, since telling people our stories is strange, and ineffectual for those who haven’t yet experienced something similar, we don’t. Though some of us wonder if it might help nudge our evolution as a society forward if more of us could “sense” our connection at a deeper, quantum level. And then prove it, scientifically, in one of our museums, so we can trust it. Is it as “simple” someday, as proving a “field” exists that binds us? How do we prove the human effect of “spooky” entanglement that physicists cannot make sense of? Several men in our group described in their own words that it seems to be about love at a cosmic level. So… we will continue to explore the ideas together, as our left brains try to make sense of the profound mysteries of an interconnected consciousness. ← Entanglement: What might it mean?